Omg! These were amazing! Taste just like the real deal! It is important to follow these instructions to the letter and to make sure the measurements are as exact as possible, especially with the fluffiness of the arrowroot flour. First time, I didn’t mix the ingredients in the blender, which is important to get the right thickness/texture. I only wanted to make 3 tortillas this morning, so I did half of this recipe and it worked out great. 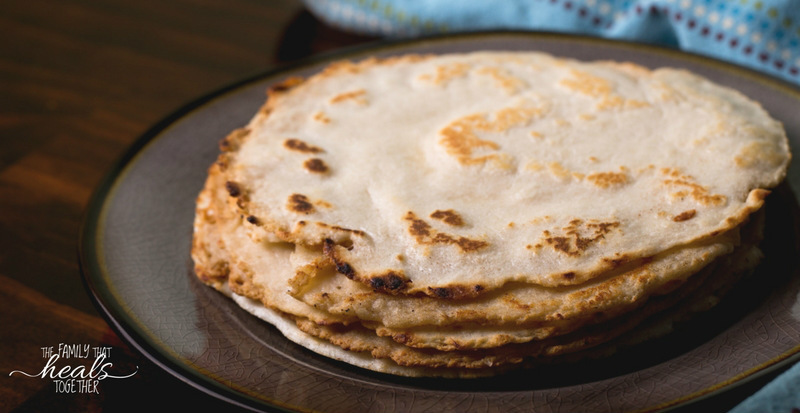 Just like making flour tortillas, you want to make sure to spread out the batter to the right size you would like. This produced three nice size tortillas. They are also bendable and have the same texture as a flour tortilla. Of course, nothing will replace an actual flour tortilla, but this is a great alternative if you are gluten free or on paleo as I am. Now, I absolutely won’t mess with the corn tortilla, ever! If I am ever out and presented with fresh homemade corn tortillas, I would not say no to those. My one question: I used ghee for the oil which is great for breakfast time, but wouldn’t be my preferred for lunch or evening meals (chicken tacos, etc). So is olive oil okay? I will assume and see how it goes! I’m so glad you loved them Marcella! Olive oil should be ok. Palm shortening also works well. Can you make these ahead of time, and line them with parchment paper in between each tortilla and freeze them?